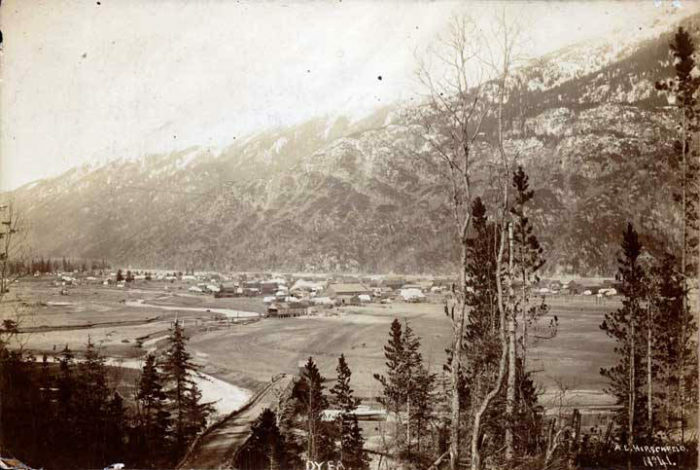 Dyea was once a flourishing Gold Rush era boomtown with hundreds of people temporarily inhabiting the area. 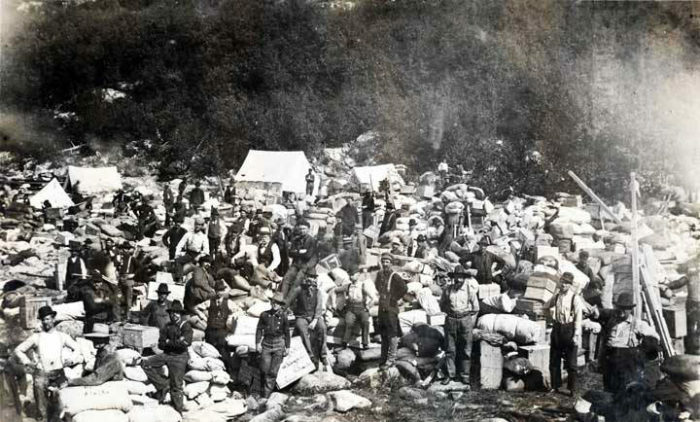 From there, they headed up the Chilkoot Trail to the gold fields of the Klondike. The remains of the town are fascinating. 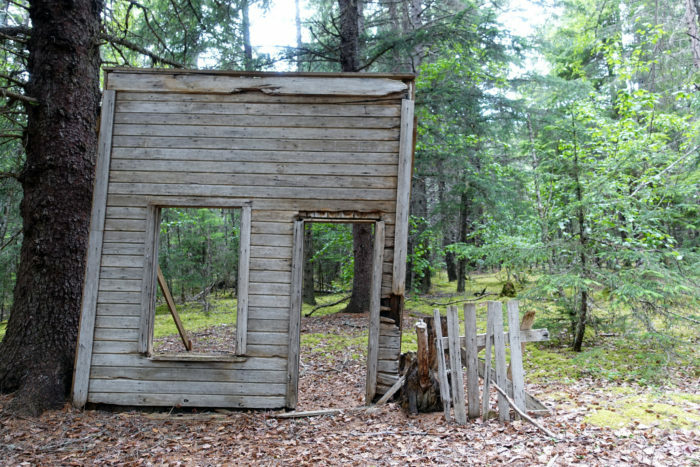 Visit Dyea to imagine life as a Gold Rush pioneer and visit the remains of the once thriving town. 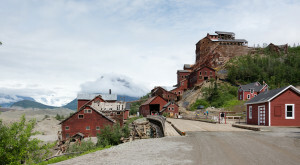 At the convergence of the Taiya River and Taiya Inlet on the south side of the Chilkoot Pass, Dyea is a ghost town. 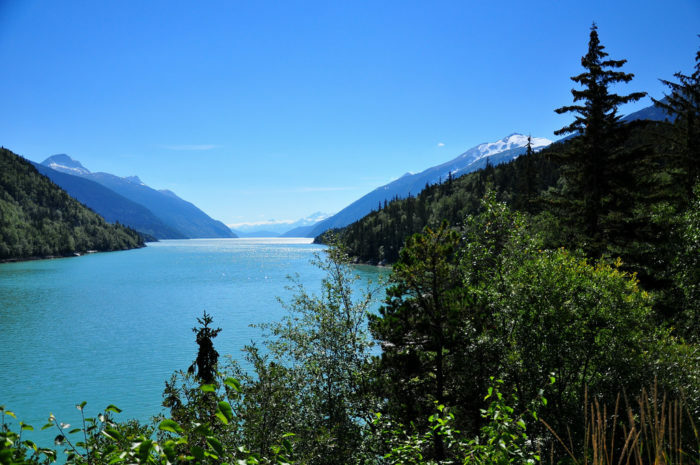 Nearby Skagway is also a Gold Rush town, but it survived and thrives to this day. 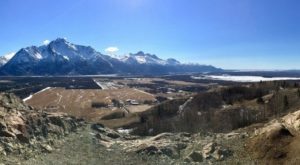 The view from the townsite is still spectacular, and it's no wonder people chose the area to live in. The mystery is why everyone left this picturesque part of the world. 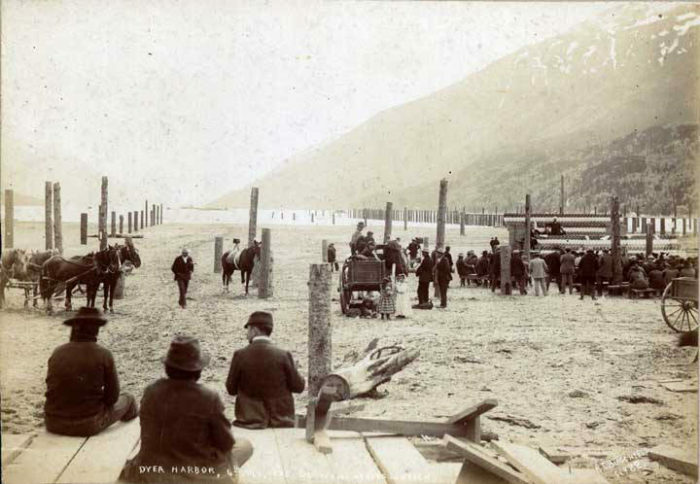 In the 1890's, people flocked to the beach to get news from home at mail call. 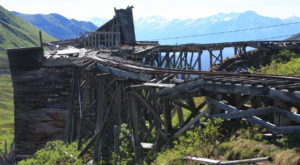 Now you can visit the remains of the pier and admire the beauty of Alaska. 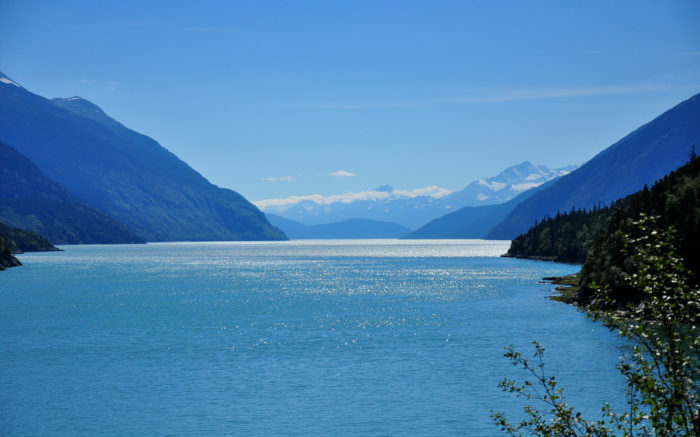 As Dyea had a shallow water port and Skagway a deep water port, Skagway pulled the shipping business. 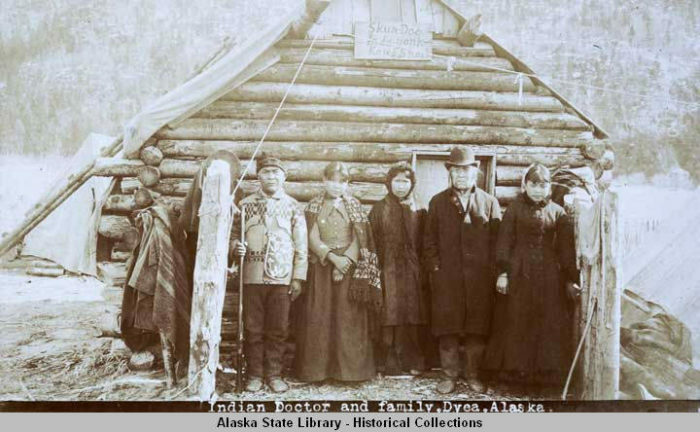 This photo is of a family that lived in Dyea in 1898. The man on the left was a doctor/shaman in the town. 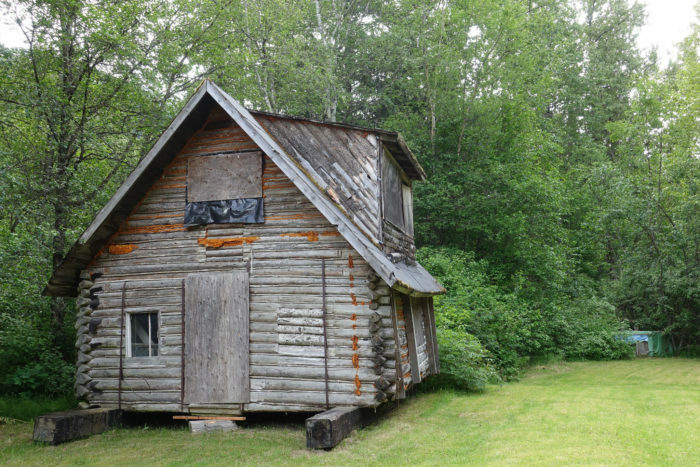 Now you can see the historic cabins like that one from the era at the Dyea townsite. 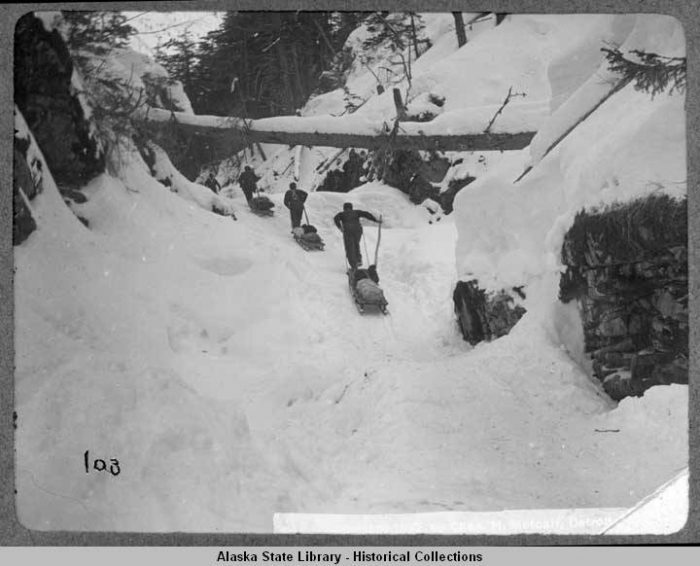 Along with the Chilkoot Trail, it is now a U.S. National Historic Landmark. There were many horses in Dyea, as they were used as pack animals over the trail to the gold fields. 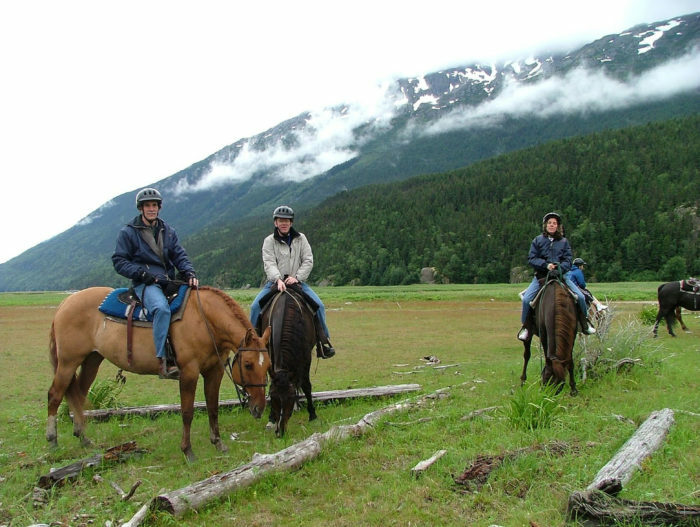 Now you can go on an easy horsebike ride for a few hours to explore the beautiful area. 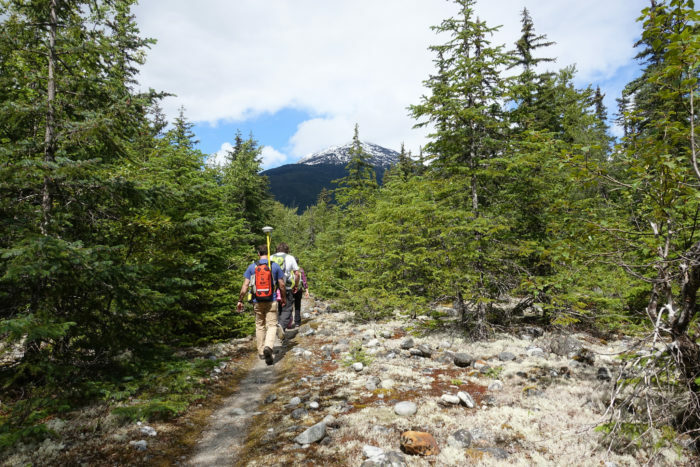 Dyea was a launching point for the Chilkoot Trail, the treacherous and thrilling hike into Canada. 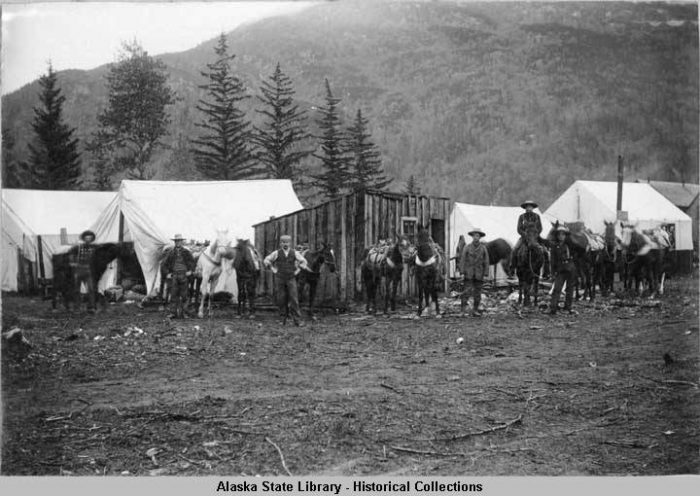 Many prospectors headed from Dyea to seek their fortunes in the gold fields near Dawson City, over 500 miles away. 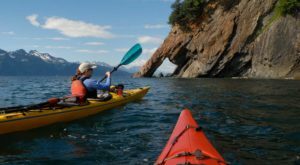 Now you can take a the Chilkoot Trail for fun and adventure. With modern technology and conveniences, this trek is certainly less dangerous than it used to be. 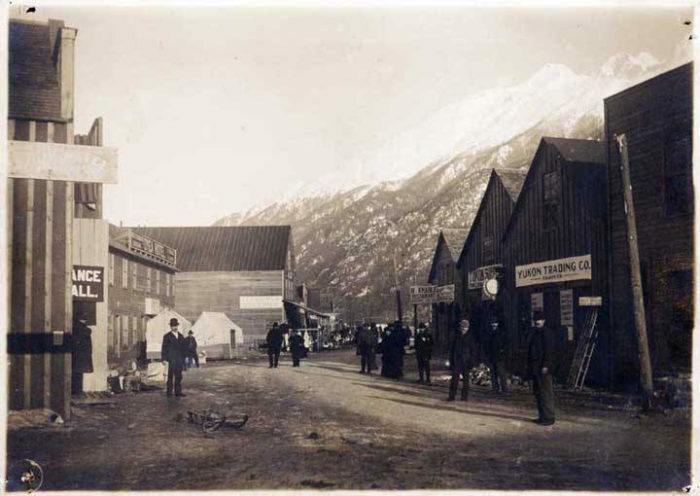 Downtown sprung up with businesses catering to the prospectors: a restaurant serving "meals at all hours", a grocery store, a general store, a bath house and saloons were among the standards for a Gold Rush town. 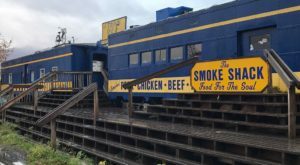 Now all that is left is this one "false front", the one face of a business that fronted Main Street. The hasty construction of town businesses led to them not lasting as well as some of the cabins. Dyea isn't really a town anymore, but a historic park dedicated to the memories of those from the past. 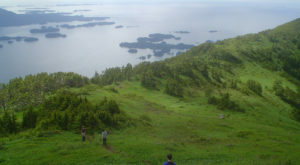 Visit Dyea, a staggering beautiful part of Alaska and learn about a fascinating part of Alaskan history. Standing here on a clear day, you'll wonder why anyone would want to leave this gorgeous place. 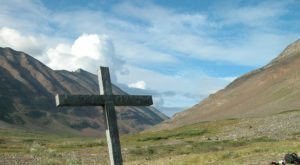 If you like this article, you may want to Follow This Iconic Alaska Trail For An Unforgettable Journey. Or you might enjoy The Creepy Small Town In Alaska With Insane Paranormal Activity. 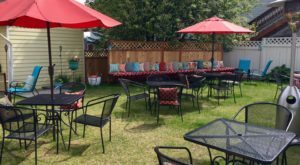 Have you been to Dyea? Tell us about it in the comments below.